Oil Painting Medic: How do I Paint Reflections in the Eyes of my Portrait? 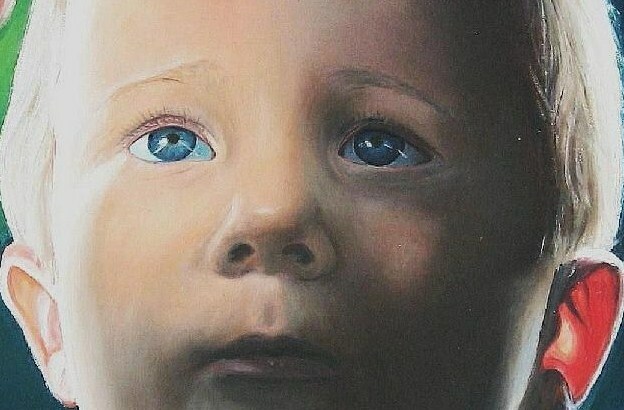 How do I Paint Reflections in the Eyes of my Portrait? Illustrating the eyes of a portrait will make or break the oil painting; but the highlights in the eyes are equally crucial. The portraitist might take great pains to achieve great skin tones and suggestion of hair with a good likeness to the subject and then with the finishing touches applies highlights to the eyes as two white pinpricks. Whilst this might be acceptable, why leave it there when a more sensitive depiction of reflections in eyes could make a good portrait brilliant? I have written a separate article offering tips on painting eyes in portraits. 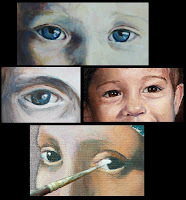 Issues such as painting the pupil, the iris and the area around the eyes are essential for a successful portrait. But eye-highlights are such a vital element that improper application could ruin the whole portrait painting. This is because very often, the highlights give the eyes light and life. The following issues with painting moisture in eyes could let the portrait down. Applying a blob of white paint into the eye with opaque paint. Placing both highlights in exactly the same position in each eye. Expressing the highlights as consistent in color and tone throughout, creating the impression of white specks or dandruff within each eye. Idealizing the shape of the highlight so that they are overly regular in shape, whether round or square. Not taking note of the other colors within the highlights. Inaccurate placement, size or position of the highlights could cause an unintended facial expression. If working from an image that has been taken through flash photography or if the face is small on the photo, then white pinpricks will often be the only reflections that can be seen within the eyes. With such little visible information, the artist can do little but use flecks of titanium white to express highlights. Even so, watch out for overgeneralizing the appearance of highlights, for often both highlights will differ slightly in shape, size and location within each eye. One highlight might be located dead-centre in the pupil, while the other might skirt the outer edge. Rather than settle for second-best, try taking a close-up photo of the face for the painting. Place light-sources as various locations around the room to create interesting highlights in the eyes. This will provide great opportunities for exploring interesting effects in eyes and a fantastic focal point. Place the subject near a window and provide a fill-in light (a lamp or similar) adjacent to the window to create secondary highlights to the eyes. This will create warm and cool highlights. Also try placing an object in front of the light source to create unusual shapes to the highlights. Set the camera to high resolution and use a slow shutter speed to pick up as much detail as possible. A tripod will be essential for this purpose. Take several photos in case some don’t work out, and take a few close-ups of the eyes themselves. The shape of the highlights. Some will be elliptical, others comet-shaped, perpendicular or simply irregular. Note how the shapes differ in each eye and how much they obscure the pupil and/or iris. Blues and crimsons will often be seen in highlights. The color is rarely just white. Notice how this color shifts at the edges. Does the color/shade shift gradually or abruptly? Is the reflection translucent in nature or intense? Can other reflections be seen in the same eye? Look for other highlights on the eye rims and the tear-duct. Notice the color temperature of these reflections. Some are warmer than others. Cool highlights will often be seen on the ‘whites’ of the eyeball. Warm hues might be seen on the fleshy area around the eye. The details around the eyes require the finest sables; not the cheap variety. Firm yet soft brushes that are springy to the touch are ideal. Kolinsky sable or those made from Daler Rowney or Winsor Newton. Size 00 and 6 ‘rounds’ should meet the demands of painting intricate detail around the eyes. Synthetic brushes are fine, as some bristles possess a blend of sable and synthetic hair. Art brushes for acrylic paint would be equally suitable as those for oils, as they have a certain level of robustness for stiff paint. The addition of a little linseed oil will help the paint flow for intricate highlights. The pigments: white, ultramarine, pthalo blue, permanent rose, viridian, burnt sienna and burnt umber should provide color mixes for most highlights that can be found in eyes. Additional others to try might be cerulean blue, cobalt and alizarin crimson. Excellent quality photos are essential for working from such small detail. Get large prints rather than small. Allow plenty of time before embarking upon eye section of the painting. A smooth art surface might be preferable, such as panel primed with gesso or fine-grain canvas. Adding highlights to the eyes will really bring vitality and life to the portrait painting. It is almost like switching a light on within the subject. I would paint the highlights last, after painting the eyes, and the surrounding area. Make sure you are completely satisfied with the pupil, iris, eyeball, eyelid, the tear-duct and surrounding area before embarking upon the highlights. I would also allow the paint to dry before adding these essential pale colors. Once you are happy with how the eyes look (see my other article on painting eyes), embark upon the highlights. Remember that highlights themselves will possess ‘highlights’ and ‘lowlights. Work thinly at first and begin with the lowlights. Look from the ‘darkest’ highlights, which might be pale blue or violet in color. Lots of highlights will appear grey, warm or cool. The following color mixes will produce the following colors for highlights; with various amounts of titanium white and each pigment in small amounts. Cool grey: ultramarine and burnt umber and white. Warm grey: ultramarine, burnt sienna and white. Silver: pthalo blue, burnt sienna and white. Violet: ultramarine, a little permanent rose and white. Greenish-blue: ultramarine, a little viridian and white. Subtle green: pthalo blue, burnt umber and white. Warm white: white and a little burnt sienna. Cool white: white and a little ultramarine. Work the paint thinly, but not runny. Dab the bristle ends only into the paint mixture. Only the most minute color mixes should be used. Gently stroke the paint over the areas concerned with a fine sable to represent the highlights in the eyes. Work progressively paler as you work over the more intense highlights. Keep looking at the photo to take note of the shape of the highlights and the color blends. Wipe excess paint build-up from the bristles to prevent the paint from inadvertently splodging onto the surrounding areas. Don’t worry if you go wrong, gently ‘lift’ the paint from the eye with a clean, dry bristle. Keep lifting until most of the paint is removed. You might have to wait for the paint to dry before working over it again. Finish with the brightest highlights with the most opaque paint, which will usually be neat white. Drag the paint over selected areas to bring the eyes to life. Stand back from the painting to ensure the highlights make sense with the rest of the painting. This is an amazing project. What a gold mine of information!